Cement Fondu (White) 25kg - Industrial Plasters Ltd. 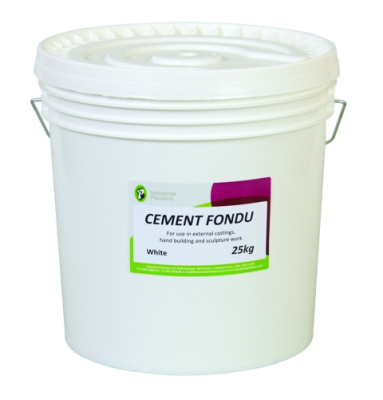 Ideal for both casting and sculpting, Ciment Fondu is widely used by sculptors because it is extremely hard and quick setting and gives superb detail. Using Ciment Fondu and an stone aggregate for a concrete mix has replaced stone for certain types of work. Because it is cheap, hard, tough, and durable, it is particularly suitable for large outdoor projects, especially decorative wall surfaces and with proper reinforcement it permits great freedom of design. By using techniques similar to those of the building industry, sculptors are able to create works in concrete on a large scale. Ciment Fondu is a fine high alumina casting cement which achieves its full strength in 24 hours, it has a working time of approximately 2 hours. The Grey is a dark grey/brown colour, White being slightly off-white. Also available in Grey, see Ciment Fondu (Grey).